It’s hard to go wrong with what you don’t have, and today’s Nice Price or Crack Pipe Aspen doesn’t have a lot. What it does have is a price tag, and we’re going to see if that has what it takes. Have you ever gone to see a blockbuster movie—one which obviously had loads of money and effort thrown at it—only to emerge from the experience with the impression that it was all for naught? I’ve had that happen following at least three Star Wars movies and I guess up to five flicks out of the Alien franchise. It seemed as though that feeling of ennui toward accomplishment was assigned to yesterday’s custom 1984 Subaru Brat. A lot of the comments went something like this—‘whoa, that’s badass... it’s also ridiculous and too expensive.’ There was also a sprinkling of ‘South Will Rise Again’ comments, but thematically it was mostly all disparagement of the Subaru’s $15,500 price, ending in a huge 85-percent Crack Pipe loss. Good thing the present owner is feeling some hesitation in parting ways with it. We tend to like things that are simple. You may recall when you were a kid playing Chutes and Ladders. That’s a board game with like two rules. Later, we learned the rhyme about Simple Simon, who is an archetype of the comedic buffoon with whom we can all relate. I know I can. Still later we all grooved to instant classics like Robert Palmer’s Simply Irresistible or the Simple Song by The Shins. Simple is good. Simple is easy. Simple doesn’t ask you to make hard choices that you may later regret. 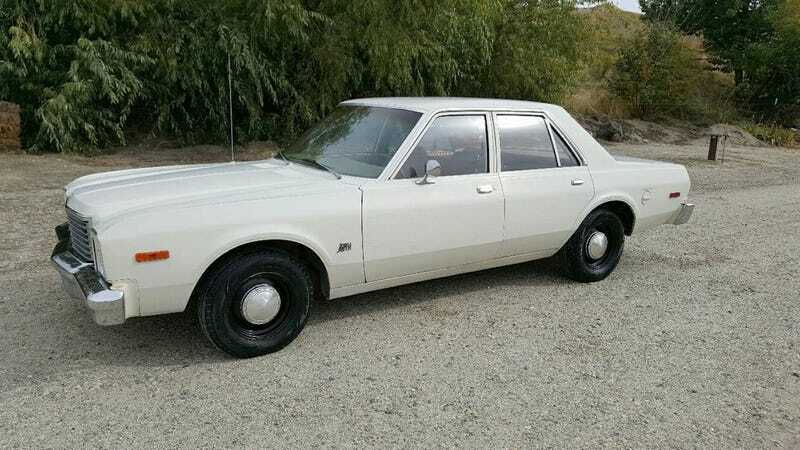 And simple is what’s represented by today’s 1978 Dodge Aspen. Now, the Aspen, and its sister from another mister, the Plymouth Volaré (whoa-oh), initially proved a complication for Chrysler. That was because the models exhibited a number of design and quality issues unknown to its predecessors, the Dart and Valiant. So besmirched were the new models that while the platform carried on under different guises well into the ‘80s, the Volaré and Aspen names were retired in 1980 after just five model years. Contrast that to the Dart which ran for 16 years. It wasn’t all bad. At the time, the Aspen was thought decent enough base by Peter Monteverdi for his luxurious four-door saloon, the Sierra. I think he built maybe three of them. Coachbuilt Swiss editions sound too complicated for our needs however, and so we’re going to stick with this plain jane, bare bones, all-original factory ’78. This Aspen comes with manual everything. Hell, there’s not even A/C to muck things up and tax the ‘70s-era horsepower here. The rest of the engine compartment appears tired, but still without anything that might make you break a sweat. I should point out though that the battery cover does look like something a guy with a chainsaw in Texas might wear on his face while he’s chasing you around his yard. Back in 1960 Chrysler became the first U.S. car maker to put alternators on their cars, and this Aspen keeps that tradition alive. Here it’s bolted to a 225-cubic inch Slant Six. As we all know, Chrysler’s lay down sally of a six is one of the world’s most notable engines. Engineered by a team led by chief engine designer Willem Weertman, the Slant Six became known for two things: its 30° cant, designed as such to fit under the sloping hood of the 1960 Valiant, and—eventually—its remarkable durability. What made Chrysler’s Slat Six so reliable? Easy, simplicity. The rest of this car seems equally uncomplicated. There’s a 727 three-speed behind the six, manually operated windows and door locks, and you get less trim here than the high school AV Club at prom. The interior features three-across benches front and back, and the vinyl upholstery seems to be in appreciably serviceable shape on both. It’s not all great in here. The headrests appear to have suffered supporting someone who enjoyed the twin pleasures of excess hair products and open car windows. Both driver and passenger seat toppers are mightily discolored on their outside edges. On the plus side, the carpet, door card, and dash cap all appear to be in fine shape. Add to that a steering wheel unburdened by too many supporting spokes and you’ve got a simple answer as to how to get from point A to Point Reyes. The seller claims the car ‘runs and drives great…’ and notes that the body is free of rust. There are a number of cosmetic issues here, including a rear bumper snood that’s discolored, and paint that’s as casper white and hence about as interesting as a semester abroad in Ottawa. The car comes with only 62,500 miles on the clock and a clean title so it does spark some interest. The most interesting factor however may be its $4,500 price. That’s more than the car cost new. Now it’s a unique driving experience and one that we’ll have to decide is worth that kind of money. What do you think, is this Aspen simply worth $4,500? Or, do you think it’s more complicated than that? H/T to rcwinget for the hookup!